I read about this on The Beer Gypsy's blog and after a day or so of contemplating, I couldn't resist and enrolled. It's within walking distance of where I work, so it'll be really easy to get to on class nights. There's a fairly popular beer glass that appears often on various Instagram beer pics that I've been wanting to add to my collection for some time. A couple of weeks ago I decided to order one, along with a few other items that they had for sale on their web site: a T-shirt and two other beer glasses. $50 in merchandise in total. After confirming with them on their Facebook page that they delivered to Canada (they even mentioned that they had recently shipped a few orders to Canada), I went ahead and filled out my order. That came to a screeching halt when I saw what the S&H was going to be: ~$35 using USPS Priority Mail. The only shipping option. I removed everything except one glass from the cart, making it a $7 order, reducing the S&H to ~$28. I was stunned, but not entirely surprised since I encountered a similar scenario a long time ago with another company. ... unfortunately for international shipping we have to charge actual cost. The total given is for international priority mail, we use this shipping method to allow for tracking capability. In the future we hope to offer a lower price for international packages. I've received trackable shipments from the U.S. before (one that same week, via DHL), and didn't pay anywhere near that much for S&H. $5 for a $30 item to be exact. I'm not saying they're overcharging, but there are certainly cheaper shipping options available and it shouldn't be too difficult to find one to offer us Canucks. What really surprises me is that there are are Canadians out there with more money than sense. Who in their right mind would pay four times the value of an item to have it shipped? This one was on my radar since I first heard of it: Opa's Gose by Beau's All Natural Brewing Company. My wife picked up two bottles for me last weekend. When I asked her why two, she said "In case you like it and it's hard to find." Can't argue with that logic. Overall: I wasn't sure if I'd like this or not when I saw the small bag of sea salt attached to the bottle and read the label saying that salt was one of the ingredients. I recall seeing people add salt to their beer to give it head wayyy back in my early drinking years and I tried it once. I like salt, but not so much in my beer. I exchanged the two 32oz growlers that I got a while ago for fresh ones or Pink Fuzz and Hop On Your Face. My first time for this one. Overall: I liked it. I think I might have to try it again for a second opinion though. Thankfully this is one of their regular brews. Kudos to Turtle Island Brewing Co on their People's Choice Award! Being somewhat of a newcomer to the craft beer scene, this is the first I've heard of it. The goal is to make this year’s IPA Day even more viral. Getting involved is easy, the only requirements are an appreciation for great craft beer and the willingness to spread the word. On August 1, share your photos, videos, blog posts, tasting notes, recipes and thoughts on IPA with the world. 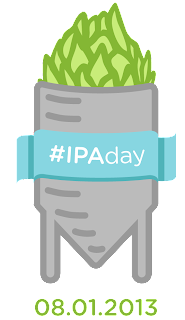 Be sure to tag your posts on Twitter, Instagram, Facebook, Pinterest, Google+ and other social media platforms with the #IPAday hashtag. Please note that this year we are using a lower case “d” in the hashtag to reduce confusion. I originally tried this one a week ago, but liked it so much that I bought another can last weekend. Fish Eye Kensington Brewing Company. Overall : A tasty beer. My personal taste for bitter beers is weakening. Pink Fuzz is a popular one that they apparently sell out of frequently. Taste: surprisingly not as bitter as I expected. This seems to hit the right spot for my level of bitterness. Overall: really enjoyed this and will be a regular purchase for me when I make it out there. It was really busy the day we went, and I have to assume it's like that all the time. Another one of their regular beers. Overall: I found the taste to be like a cross between Pink Fuzz and Half in the Barrel.Or maybe I was half in the barrel by then. :) Either way, tasty. Yum. Aroma: sweet oak red wine? Overall: I really enjoyed this. My wife liked it as well. Easy drinking nicely balanced beer. I'd love this to be a regular brew. Had this one a little while ago. Central City Brewing Co's Imperial IPA for Autism. Taste: hoppy grapefruit kinda creamy or low carbonation. It says it's 90 IBU. I think my taste buds area adapting to bitter beers. Overall I liked it, and it's a great beer for a great cause. $5 per bottle goes to autism research. I've seen these four Wellington beers at the LCBO for some time and a week or two ago decided to give them a try. Overall: Pretty good but it seems to have a bitter aftertaste that I'm not a big fan of. I'm tempted to try this with the chocolate stout cupcake recipe. Overall: a nice session beer. Very easy drinking. Overall: good dark ale. Similar to others I've tried. Testing the new Instagram embedded share code. My wife and I attended the Waterfront Festival in Toronto a couple of weeks ago, and while we were there we had to visit the Steam Whistle Brewery and take the tour. The afternoon that we went was packed. It seems that we picked a day when there was a Blue Jays game on, and quite a few people were there to prime themselves for the game. So anyway, during our wait, we enjoyed a couple of free ~4oz samples of their fine beer. I then purchased to additional cups to quench my thirst. I wasn't aware that they feed you more beer during the tour. There was live entertainment in the main bar area, to keep all the Blue Jays fans (and other tourists like us) happy. Finally when it was our turn for the tour, we were brought upstairs to a separate bar. This is where we were told what to expect and each given a headset, and a bottle of beer from this fridge to drink during the tour. She also told us some history about the roundhouse building that they occupy, which was also very cool. We got to see, and taste if we wanted, barley and hops. I tried the barley, which didn't taste too bad. I skipped the hops. At the end of our tour, we ended up at the upstairs bar again, where we were again offered another ~4oz sample of beer. All in all a very cool, and delicious, tour that I would not hesitate to go on again. I highly recommend it. My wife and I headed down to Parkdale Park a little after noon on Sunday. It's a pretty small park, but it wasn't too crowded for the duration that we were there. I can only imagine how packed it would be later in the afternoon. After having a blue wristband put on us, one of the volunteers gave us a quick rundown of what's what and where's where. That was very helpful, rather than just letting us wander around figuring things out on our own. We waited in the beer & food ticket line for about 10-15 minutes to buy our $20 souvenir mason jar mugs, which included 2 beer tickets each, and we also purchased 2 additional "collaboration beer" tickets for $4 each (for a half cup of beer). A full cup was $6. Proceeds from the even went to The Ottawa Riverkeeper. The wait would have been much shorter if we had been paying cash. We managed to try 3 out of the 4 collaboration beers and enjoyed them all. I think the one we missed was a lemon wheat at the Broadhead tent (collaboration with Amsterdam). My wife's favourite was the Cranberry Saison. I was pretty tasty and very non-beer like. I liked the Golden Devil. I also enjoyed Broadhead's own "Longshot". For lunch, we bought a ticket for a Hintonburger "organic" burger. Pretty tasty but a little pricey. I think it was the same price as a beer. Now I'm really looking forward to the National Capital Beer Fest in August! I picked this one up at an LCBO in Toronto while we were there for the Waterfront Festival: Seigneuriale by Unibroue. Overall: Loved it. Another win by Unibroue. Although without being able to compare it side by side with la fin du Monde or Maudite I'm not sure how different it is and I loved both of those. Shawinigan Handshake by Le Trou du Diable. My first from them too, I believe. Overall: Surprisingly good. A hoppy Weissbier. Grapefruity bananas. Loved it.